Direct-Applied Exterior Insulation Finish Systems or DEFS are systems designed for use on weather protected walls and non-insulated exterior walls, soffits & ceilings. The Decoplast DDS Groundcoat system is a direct applied system. The DDS Groundcoat system uses a Weather Resistive Basecoat to protect the buildings substrate and close the building envelope. The ACF CMU System is an exterior coating system for application to ASTM C 1177 compliant glass mat faced gypsum board or cement board on exterior soffits. Where the soffit is considered a weather exposed surface in accordance with local building code, it may require a water resistive barrier above the sheathing. Direct applied system for cement board sheathing on vertical walls and soffits. Direct applied textured finish application applied direct to the surface of a concrete surface. Non-Loadbearing Exterior Insulation Finish Systems with or with out Moisture Management for use on Metal & Wood framed buildings, CMU , Brick or Concrete Buildings. embedded with Fiberglass Reinforcing Mesh, Primer (Optional), and Textured Finish Coat. The DecoDrain Adhesive Release System “Notched” is a Moisture Managed EIFS system using liquid applied air moisture barrier and vertical notched adhesive to create a drainage plane. 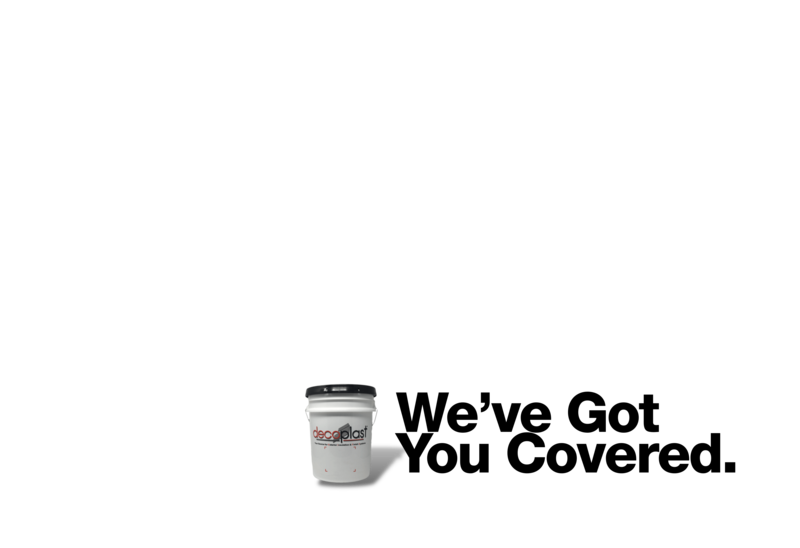 The DecoDrain Adhesive Release System “Speedcoat” is a Moisture Managed EIFS System that uses Grooved EPS to create the drainage plane and combines the basecoat adhesive and weather resistive barrier into one product. A Continuous Insulation (CI) Moisture Managed Exterior Insulation and Finish System (EIFS) consisting of a trowel applied Weather Resistive Barrier & Adhesive combined into a single application. Grooved Extruded Polystyrene Insulation Board (XPS), Base Coat with embedded Fiberglass Reinforcing Mesh, Primer (Optional), and Textured Finish Coat. A Continuous Insulation (CI) Moisture Managed Exterior Insulation and Finish System (EIFS) consisting of Liquid Applied Weather Resistive Barrier, Notched Basecoat Adhesive, Extruded Polystyrene Insulation (XPS) Board, Base Coat with embedded Fiberglass Reinforcing Mesh, Primer (Optional), and Textured Finish Coat. The Decoplast DTS Heritage system is a mechanically fastened EIFS system used over wood sheathing. Drainage mats can also be installed to create a moisture managed system. Polymer Modified Portland Cement Based Stucco Cladding Systems for use on metal & wood framed buildings, CMU, brick or concrete buildings. The Decoplast Decowall FRS system is a traditonal cement stucco system that consists of lathing, scratch coat, brown coat, and a Textured Finish Coat. Liquid Applied Weather Resistive Barrier System for use behind any exterior wall cladding. 100% acrylic based trowel, spray and roll-on air and water-resistive barrier membrane. Designed for use as an air and water-resistive barrier behind EIFS and other claddings. This product is installed over glass mat gypsum sheathing, cement board sheathing, CDX plywood, OSB, concrete or CMU.